The heritage city of Vigan in the Philippines has been named as one of the New7Wonders Cities of the World. Vigan is joined by Beirut, Lebanon; Doha, Qatar; Durban, South Africa; Havana, Cuba; Kuala Lumpur, Malaysia; and La Paz, Bolivia. The said cities won the multi-round online and SMS voting from a pool of 1,200 cities from 220 different countries that were nominated. The winners, which "represent the global diversity of urban society," were announced Sunday, December 7. A UNESCO World Heritage site, Vigan in Ilocos Sur is dubbed as "the best preserved example of Spanish colonial towns in Asia." 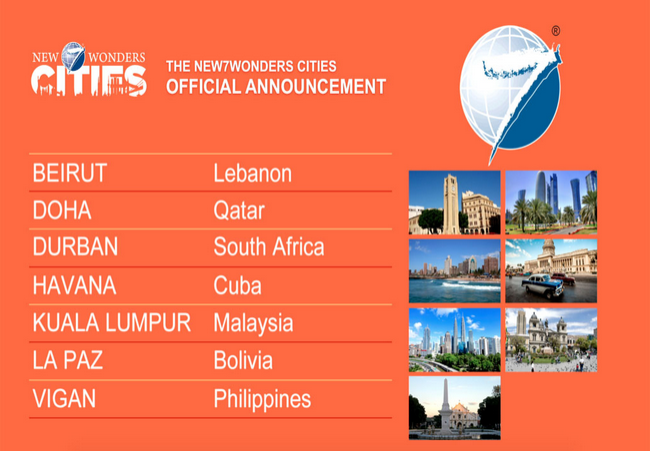 New7Wonders Cities is a project of the New7Wonders Foundation, an organization looking to promote the beauty of this world as well as respect for cultural diversity. The group is also responsible for endorsing and promoting the Puerto Princesa City Underground River as one of the New7Wonders of Nature.